The Better Oats Grains of Change tour pits Better Oats against its rival candidates and allows you to voat for your favorite. The tour, which launches in Quakertown, Pennsylvania, and heads through other “Quaker” locations across the United States, will wrap up in Minneapolis at Peavey Plaza on Monday, September 20. Be there between 7:30am and 1:00pm to hear rally speeches from Better Oats “Oatmeal Czar” on why Better Oats is the choice of a new generation, taste the two candidates and then voat for your favorite. You even get free oatmeal! Plus, Better Oats will donate 250,000 bowls of oatmeal to Second Harvest Heartland! And, for every person who tastes and voats on-site, Better Oats will donate an additional 100 bowls of oatmeal. This is your chance to decide which oatmeal you prefer, don’t miss out! 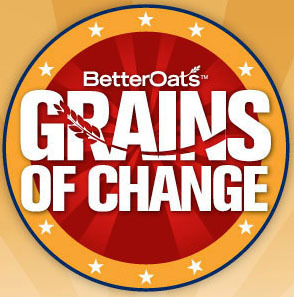 For more details and to follow the Grains of Change tour visit Better Oats facebook page, or tweet with them.